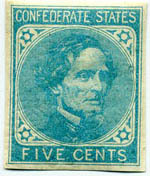 The stamp's central motif is a portrait of Jefferson Davis, designed and engraved on steel master dies by Jean Ferdinand Joubert De La Ferté. Printing Invoiced: 12,405,000 5¢ stamps. Only 7,405,000 were received by the Confederacy; 4,855,000 on the Bermuda were captured and ordered destroyed by Federal court order. There is a slight discrepancy in numbers noted. They were delivered in half sheets of two hundred, two panes of one hundred each, divided by a vertical gutter, and there was no imprint. Plating is unnecessary as complete panes still remain, but there are a few small varieties of note, mainly on the margins. The stamps were printed on thin, hard-surface paper with clear to white gum and were imperforate. The color was light blue and the impressions are clear and distinct.The paper is cellulose, which can be determined by XRD (X-ray diffraction). The ink pigment was mixed with vegetable oils, as determined in recent years by FTIR Spectroscopy (Fourier-transform infrared spectroscopy). The earliest recorded date of use is April 16, 1862. The most typical use is of pairs paying the ten-cent letter rate after July 1, 1862; less frequently seen is for the five-cent rate (under 500 miles) before the rate changed. See Trouble Spots for how to tell the difference between CSA 6 and CSA 7 issues, as well as the New York counterfeit, Ward private printings and other facsimiles and forgeries.